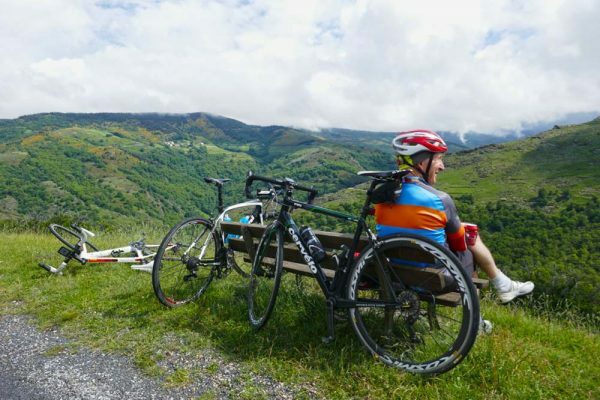 For this cycling tour, our signature HighRoad goes off the beaten path with an all-inclusive week in southern France’s Cévennes mountains. 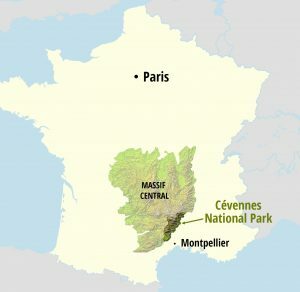 This is the real France Profonde (deep France) and only real explorers are familiar with this area and its hidden roads. For those prepared to climb 1,500+ meter cols, roll across starkly beautiful plateaus and descend through deep river gorges, this bike tour is for you! And you don’t have to be a hardened explorer off the bike, as each night’s accommodations have been carefully chosen to provide a high quality and comfortable retreat where we will refuel our bodies with an abundance of delicious local food. Our HighRoad Cévennes tour starts at the bottom of the Gorges du Tarn, one of the most beautiful gorges in Europe. From here we head east, entering an area of the region dominated by large granite massifs – two of which we’ll climb (Mt. Aigoual and Mt. Lozère). 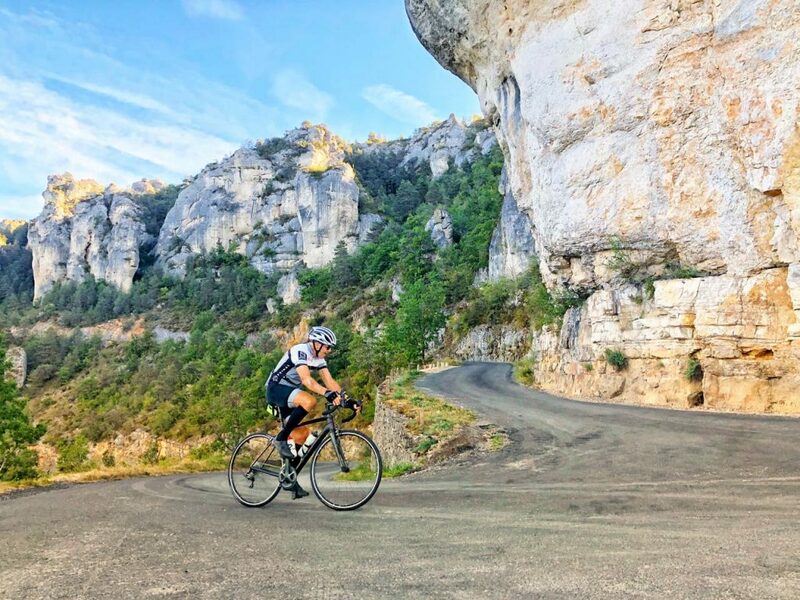 After dipping into the wild, forgotten Ardèche department, we track south on the Queen Stage of the tour, climbing several cols, including our 2nd ascent of Lozère and le Tour de France climb of Perjuret. 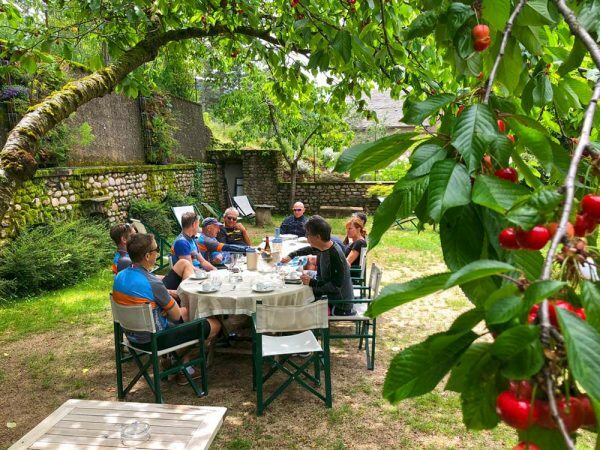 Our tour finishes back where we started, with a gourmet celebratory dinner and perhaps a chat about where you’ll be riding next time you visit! Support van that will be on the road with you, offering assistance, encouragement, and food and drinks. 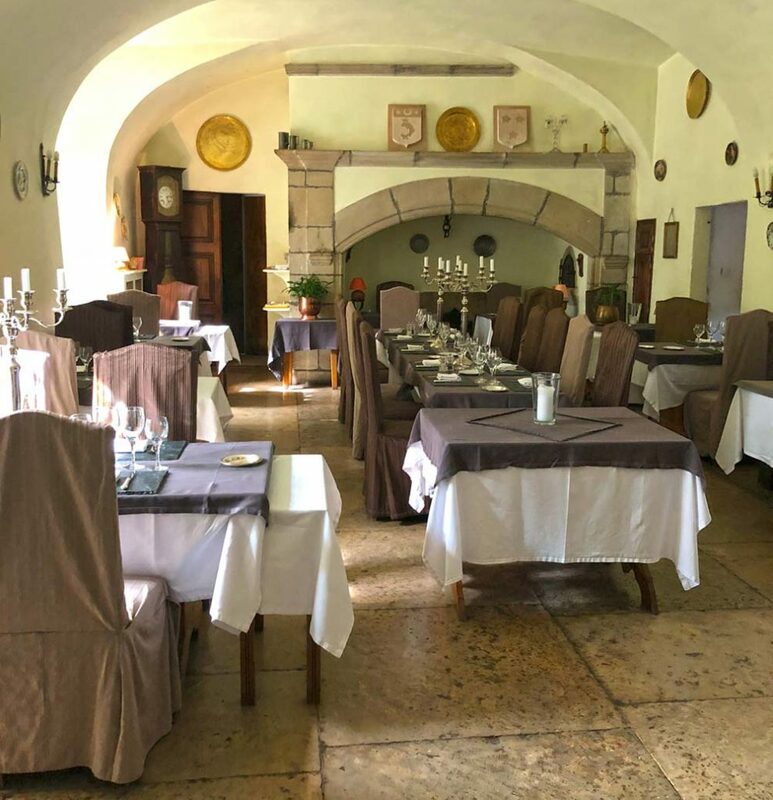 Your typical day in the Cévennes begins with a healthy buffet breakfast, followed by a ride in this hidden region of France. Most rides will end back at your hotel (or the next one along the route) for a post-effort lunch. However, on longer days in the saddle (Day 3 and 6 for example) it will be a picnic lunch on the road. You will always have a few hours in the afternoon to relax and explore your surroundings before we meet for a dinner of delicious local fare. We will pick you up at Montpellier airport in the morning and transport you north to our hotel on the banks of the Tarn River. During the afternoon, you’ll have time to freshen up, fuel up and ensure your equipment is in top working condition. If time permits, we will take a short warm-up spin through the gorge. Finally, we’ll all settle in to get to know each other better and review the upcoming week over a satisfying welcome dinner. We ease into our first day on the bike with an unforgettable ride up the amazing Gorges du Tarn. This deep canyon is beautiful on its own, but quaint villages, medieval bridges and the many castles that line the entire route combine to make this one of the most enjoyable bike rides in France. Still, you’ll work today, and you will be happy you did when you see the food that is placed in front of you at dinner! Now that you’re warmed up we’ll climb some cols! 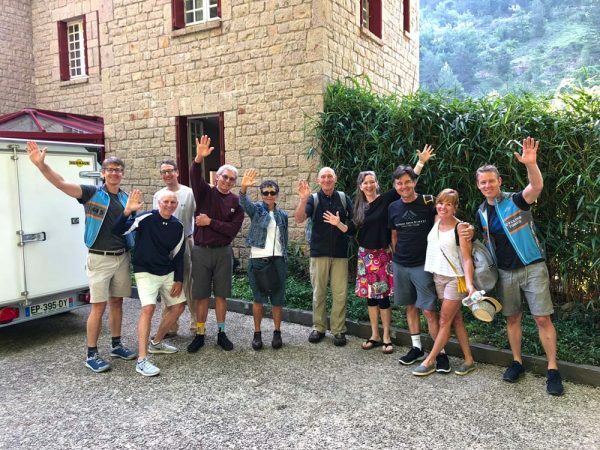 Today’s loop leaves straight from our hotel, traveling south through Florac before the wonderful, hidden ‘backdoor’ to our first big climb of the tour – Mont Aigoual. At 1567 meters, this is the highest we will climb this week, but it will be well worth the effort. From the top, on a clear day, you can see the Mediterranean Sea, the Pyrenees and even the Alps. 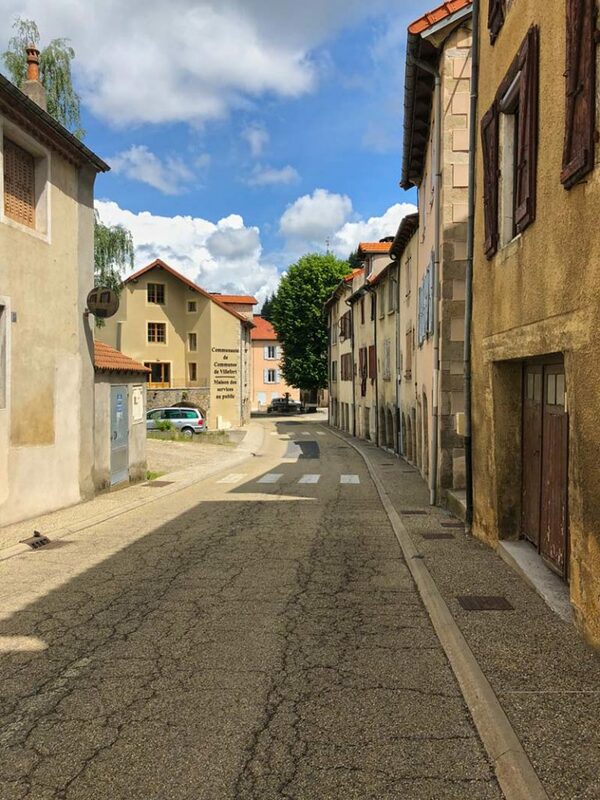 Our descent brings us to the pretty valley town of Meyrueis, where we take a deep breath before climbing up to the Causse Méjean. One of 7 ‘Grands Causses’ (high limestone plateaus) in the Massif Central, this steppe-like plateau is home to a herd of the last truly wild horses in the world – Przewalski’s horse. 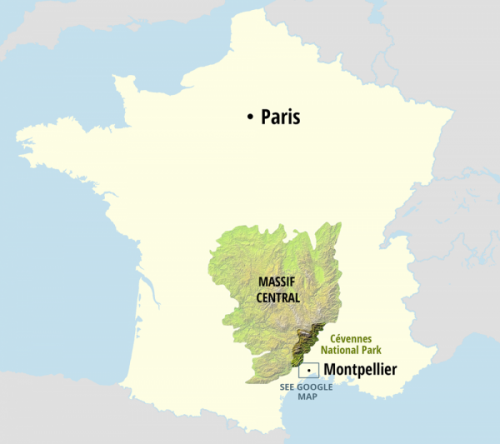 Climbs today include Mont Aigoual, of course, plus the climb up to the Causse Méjean (6 km, 250 m). This morning we follow the Tarn River upstream to Le Pont Montvert, tracing Robert Louis Stevenson’s 19th century voyage in reverse. 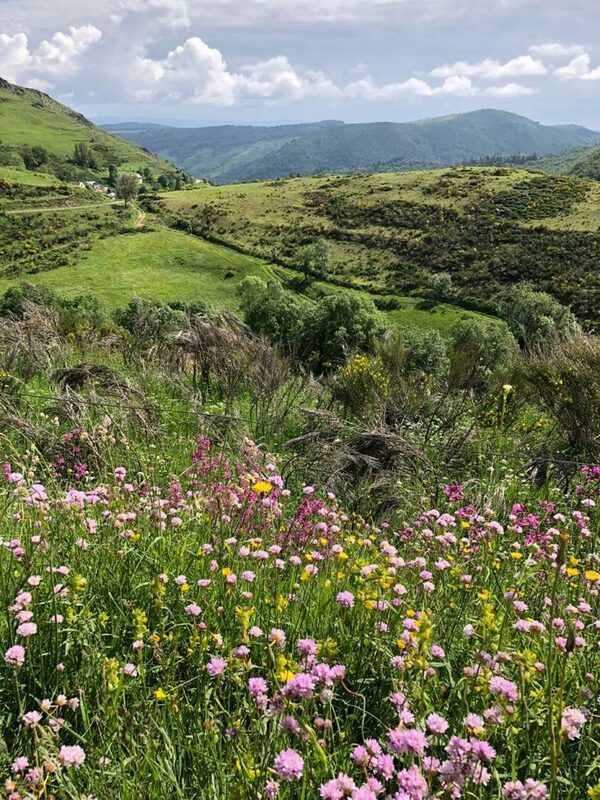 Look around and you’ll see the terraced fields where Stevenson and Modestine spent a restless night before their walk down the Tarn River to Florac. Today’s major climb, the Col du Pré de la Dame, begins in Génolhac, and offers both hairpins and fantastic views all the way to Mont Ventoux. 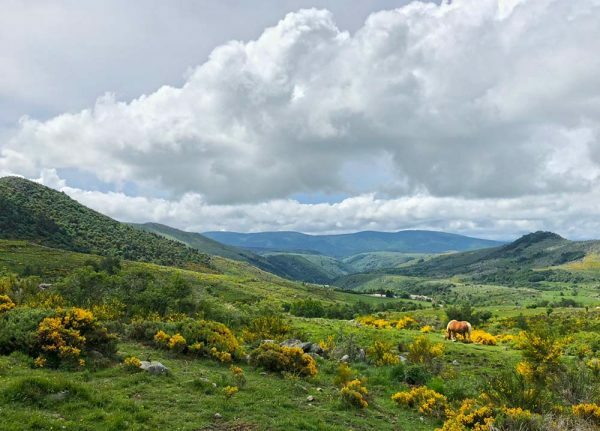 Your reward is an equally amazing descent down the other side of the highest mountain in the Cévennes, Mont Lozère, passing forgotten hamlets, pristine pastureland and hilltop castles. Then, a little further up the road, our baronial mansion will be waiting for us. With your first ascent of mighty Mt. Lozère behind you, but perhaps still present in your muscle memory, we’ll take it a little easier today both in terms of mileage and climbing. 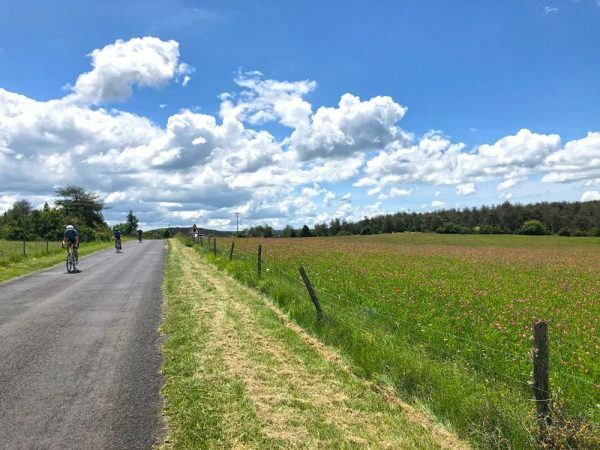 Our route winds through three departments, the Ardèche, the Gard and the Lozère, and offers the shade of immense pine-wood forests, the freshness of small river valleys and some of the best country roads we’ve been on yet. This is your chance to recover and conserve energy for tomorrow, while reveling in the solitude and unadulterated beauty of the region. Back at the hotel, you’ll appreciate an afternoon of rest and relaxation, followed by another delicious dinner. There are no cols on today’s ride, but you’ll climb nonetheless! Be sure to fuel up at breakfast this morning because we have our longest day on the bike today. We’re heading back up Mt. Lozère today; this time over the Col de Finiels (1541m). While it’s an easier climb than two days ago, the views are no less spectacular. Our route will then take us up the Col de Perjuret (1031m), made famous by Roger Rivière, who in the 1960 Tour de France overshot a curve and tumbled into a ravine, effectively ending his career. We’ll pay homage at his monument on the way up, and vow not to repeat his mistake on the way down the other side; a much more forgiving descent of 15 km, ending at our chateau-hotel for the night. We’re back in deep gorge country, and today you’ll be treated to one of the prettiest, the Gorges de la Jonte. Our 25-km ramble down the gorge will take us past its impressive 450m high sheer rock faces. While you’re looking up to admire the sights, you may get lucky enough to catch a glimpse of one of the several hundred vultures who make their homes among the cliffs. 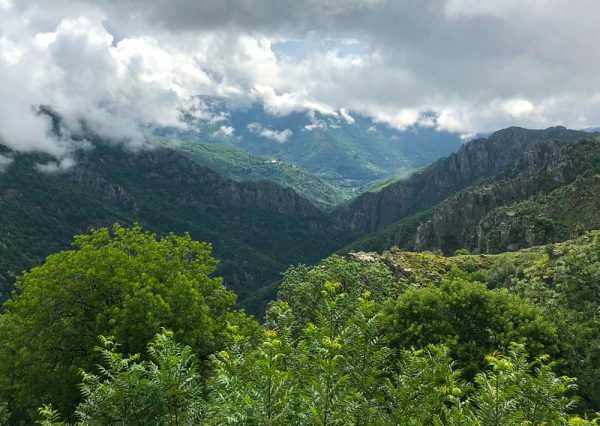 Our climb out of the gorge takes us to the top of another one of the Cévennes’ impressive limestone plateaus, the Causse Noir. Sparsely populated and often wind swept, we’ll ride its gentle roads to our final hotel, and celebrate the end of a truly amazing adventure tonight over dinner. Today we drive you back to Montpellier for your connection home or your local hotel if you are staying in France. 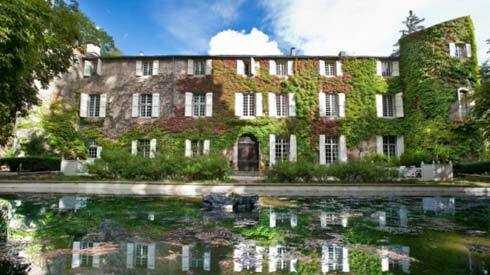 Accommodation for High Road Cévennes ranges from eco-friendly 2-star to baronial 4-star. All our hotels have fantastic gourmet restaurants featuring fresh, locally-sourced produce, wifi and comfortable common areas where you can put your feet up and relax in comfort after a good day on the road. For a fitting way to start and end our tour, we have chosen the Hotel de la Muse, a landmark establishment in the region. 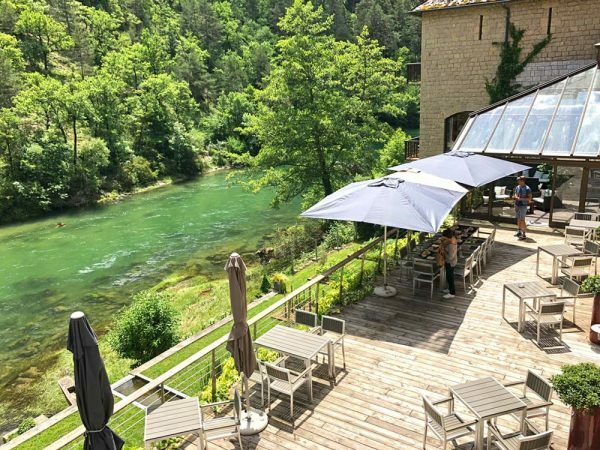 Originally erected in the early 1900’s by the Touring Club of France, its privileged position at the confluence of the Gorges du Tarn and Gorges de la Jonte make it an ideal base for exploration. Take advantage of your rest hours by taking a dip in the outdoor pool, or the cool, inviting waters of the Tarn River. 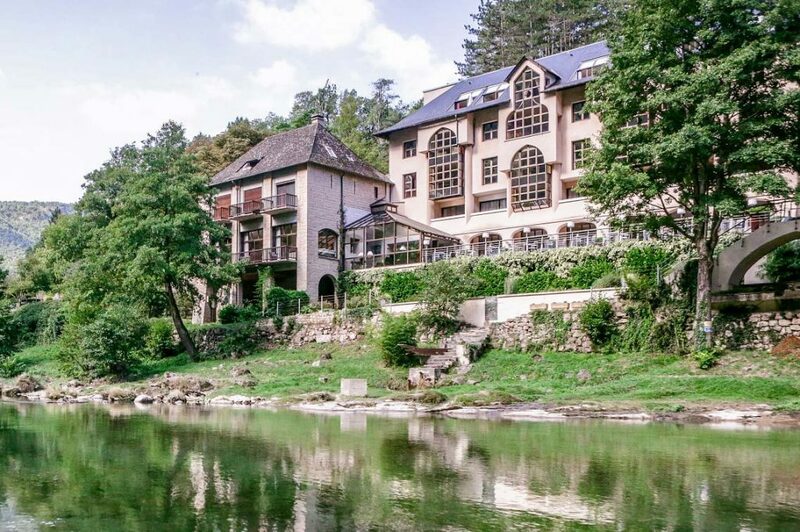 This charming, eco-friendly hotel has been in the same family for three generations. 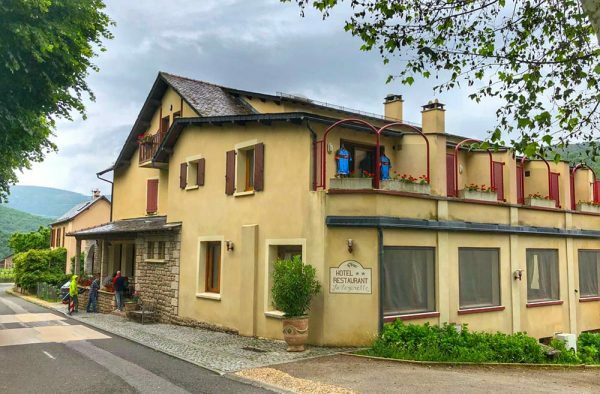 It is an ideal base for cycling, nestled on the edge of an authentic Cévenol village in the lovely upper Tarn valley. When we aren’t out on the bike we’ll be treated to gourmet meals that highlight the flavors of the local mountains. Dramatically perched on a high plateau overlooking the Chassezac Canyon, this 400 yr. old ex-baronial residence provides you a warm welcome. 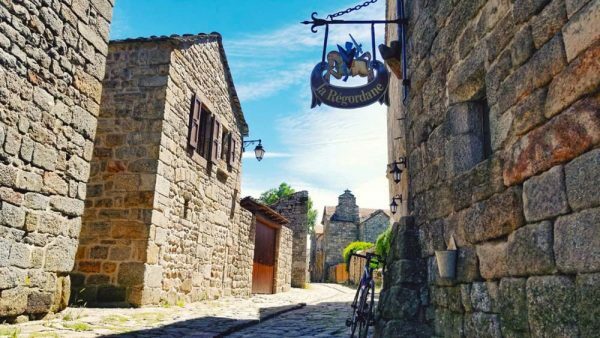 La Regordane (named after an ancient pilgrimage route) is situated in the fortified village of La Garde-Guérin and listed as one of the most beautiful villages in France. Hidden on a quiet hillside behind Meyrueis, this 12th century Benedictine monastery provides an ideal spot to contemplate the history, culture and jaw-dropping beauty of the region. While an 18th century addition enlarged the space, and 21st century comforts have replaced monastic vows, dining in the original “refectory” or walking the 15-acre grounds continues to be inspiring.